What happens when a group of researchers discover a forgotten prayer tool from the middle-ages? Is it still relevant in the hustle and bustle of the world today? What does the past have to teach us about the future? Seek good and not evil, that you may live; and so the Lord, the God of hosts, will be with you, just as you have said. A few weeks ago I found myself sitting in a sanctuary filled with pastors and lay people for a class on spiritual disciplines. Our teacher led us through a lecture about the means of grace and the many ways that we can find communion with God through spiritual disciplines. We heard about the value of reading scripture, praying for God’s intercession, and listening to the silence. All in all it was a very informative class, and I believe that many of us left with a renewed spirit and dedication to living prayerful lives. However, in addition to all the wonderful comments during the class, I overheard the instructor talking with someone on the way out and what he said stopped me in my tracks. That question is one that cuts straight to the heart. Though I was unable to pick up on the rest of the conversation, I can imagine that the instructor was trying to make the point that, as we read in Amos 5, if we seek the good, God will be with us. We can pray and commit ourselves to spiritual disciplines, but unless those disciplines are bearing fruit in our lives then they might need to be reconsidered. 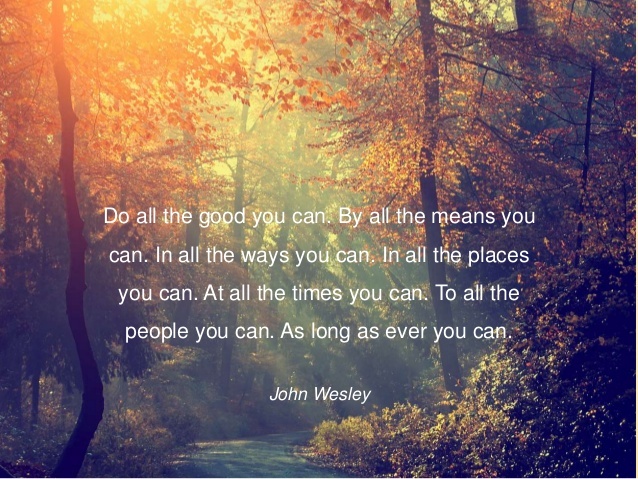 In our lives, how often do we strive for the good? If God’s presence feels absent, if we want to experience God’s love here and now, then one of the best things we can do is seek the good and discover God’s presence along the way.